Now I am well and truly in holiday mode. Thanks Robyn! Robyn also wrote the recent Asian Wall Street Journal article on Filipino food. Same here in Darwin. I’m going to the newsagent to check if they have one. Thank YOU Marketman. We can’t say this was ‘work’, though we did make several days of dawn mass! ;-) Our Christmas in Arayat was so special, in so many ways that have nothing at all to do with publication in a major mag – memories we’ll cherish forever. And getting to know the PHI and its food has been one of the highlights of the last couple years for us. We look forward to more, longer, and more in-depth visits in 2009. Yes – it’s high time Filipino cuisine got its place in the sun internationally! yan na ang recipe ng hinayupak na ensaimadang pinagyayabang ng madla. pina-publish ko na ang recipe dahil hindi ako swapang. que recipe nga daw ni jose rizal, nakakataba pa rin yan. try it nga and see if it works. i don’t know if they printed the recipe i gave them. kasi papa-kitchen test sa US pa daw. kung masyadong dry, bawasan mo ng 2 minutes ang baking time. Amen…..Marc!!!! Madagal ko na huling narinig and “hinayupak!”….I am soooo sorry…I cannot stop laughing!!!! Hey Marc..I would love to be your tester here in North America! How about it, MM…you be the tester there and we can compare notes!!! Thanks for the tip on Saveur-will pick up my copy tomorrow. Robyn, then you MUST come by Cebu for lechon and side salads, then maybe a side trip to Bohol for the delicacies there. Both provinces have some pretty amazing markets too… :) Marc, will try recipe and give you a critique! The Ensaimada recipe (as well as Adobo and Pinakbet) can be found on the Saveur website. I can’t wait to try this out! Hey Marc…please bear with me for I have a few questions:…yeast, is that a typo? next…the eggs….22 egg yolks. Am I to assume they are the small size eggs? or are they large…since eggs vary in weight and are graded maybe differently there…for consistency, how about measuring them in cups…so those trying the recipe here will have the same texture of the baked product! no salt in the recipe? …maybe because the cheese incorporated into the dough is salty enough? Thanks for the tip MM, I’ll pick up the December Saveur asap and hopefully persuade some of my U.S. readers to have a gander as well. To Robyn, am a fan of yours and your hubby too. Maraming salamat! At last, Philippine cuisine is given attention. To Robyn, MM and all Filipinos whose love and tireless devotion for Filipinos cuisine is remarkable, I salute you! MM, where can we buy this issue to Saveur in Manila? arrgh, my Saveur subscription hasn’t arrived yet! now i’m tempted to get a newstand copy…. This article was a great read. 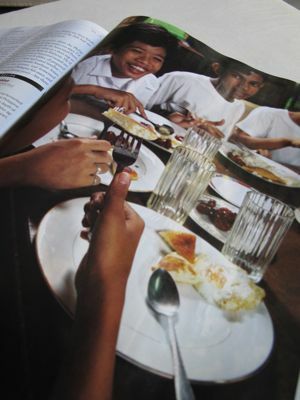 I was so happy that the Philippines was featured in the Holiday issue, no less. 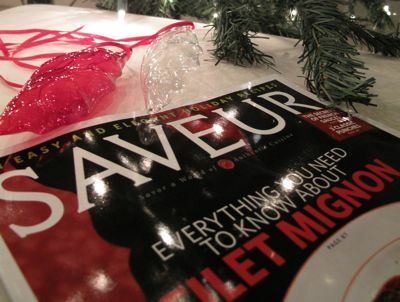 It’s about time that Saveur made this happen. I’ve been reading this magazine since 1996…sa wakas!!! I know many non-Pinoy Americans who claim to love Filipino food, but when asked to elaborate they invariably say “lumpia” or “pancit” and sometimes “adobo”. I’m glad that magazines like this are giving Filipino food broader exposure in mainstream America. But it’s getting there. There’s a very nice, affordable, sit-down Filipino restaurant in San Bruno called “Patio Filipino”, where the food looks nice and tastes great and the service is quick and efficient. Some people involved in that restaurant are also about to open another one called “Intramuros”. And there’s a California cuisine/fusion restaurant that’s Pinoy-influenced called “Archipelago” in Burlingame. I’m so happy about all these restaurants. To me it’s like West Coast Pinoy restaurateurs are finally taking cues from New York’s Cendrillon. Mark’s “hinayupak” made me roll with laughter! Ha ha ha. Hope I can get the courage to try my hands at ensaimada…hmmm…let me see. Never did try ensaimada. 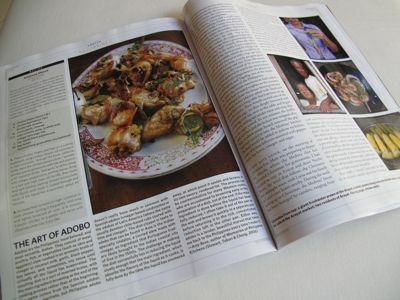 Let me get a copy of Saveur and see…..Thanks MM ! My daughter said am addicted to this site. Yup I said. I am…. Such fun. Reading and trying. Failing or being victorious…still have to get the putong ube right. Tried many of your recipes and they’re great..Daghan Salamat. mm, you’d be happy to know that the hubby and i paid more attention to saveur since your blog entry on the magazine and James Oseland’s background a while back. we read gourmet, but the hubby’s been an ardent follower of saveur ever since he tried several recipes to stellar results (so guess who’s getting a subscription for Christmas?). we were really so excited to read this feature when we picked up this issue in downtown toronto last weekend; i even blogged about it. definitely another proud moment in filipino cuisine for sure. Hi bettyQ, you are absolutely right about the eggs. Wow! imagine 1.2 eggs per ensaimada. And no salt? don’t you need a little bit of salt for the proper rising of the dough? or that is good only for the instant baking powder. I can’t remember from my 6th grade cooking class half a century ago, hee, hee. and for the adobo recipe in Saveur, don’t you think 10 bay leaves is quite an intoxicating amount and over saveured? I’ve never seen any recipe call for that much bay leaf. BTW, I am wondering what is cooking in your kitchen today, Thanksgiving day. Wish I were invited. A blessed Tanksgiving to you, MM and all. Although these fluffy sweet-savory breakfast rolls are traditionally prepared with pork lard, most Philippine cooks nowadays use butter instead. Dutch edam cheese is sprinkled inside and on top of the dough, offering a subtle counterpoint to the breads’ sweetness; for a more savory roll, add more cheese. To make these rolls, you will need ten 5 1â„2″ fluted brioche molds. 5. Using your hands, grease a marble slab or other smooth surface with a little butter. Transfer dough to the greased work surface; divide into 10 equal pieces. Roll each piece into a ball; flatten each ball into a 6″ circle. Fold edges of each circle in toward center. Transfer dough pieces, seam side down, onto 2 greased baking sheets. Cover with damp towels; set aside in a warm place to let rest for 10 minutes. 6. Line ten 5 1â„2″ fluted brioche molds with 9″ circles of parchment paper. Divide molds between 2 baking sheets. Working with one dough piece at a time, use your hands to press it into a paper-thin, translucent square, about 14″ x 14″, on the greased surface. (The dough will tear in some places; that’s okay.) Sprinkle the dough square with 2 tbsp. cheese. Starting at the edge closest to you, use your fingertips to roll the dough toward the far edge, forming a rope about 1â„2” thick. Gently flatten the rope. Roll the rope into a spiral, tucking the end under. Transfer the spiral to a mold, tucked end down. Cover the molds with damp towels; set in a warm place to let rest until almost doubled in size, 1 1â„2â€“2 hours. (the color of in the pictures are a bit dark. i like the golden color na hindi naman mukhang anemic o namutla sa init ng oven…eh kayo ba naman ilagay sa oven eh di ba naman kayo mamumutla? pero atat-na-atat si robyn at si dave mag picture taking kaya sige pinayagan ko nalang. but i prefer a lighter color. it all depends on your over. kung masyadong dry o maitim ang hinayupak na ensaimada, just bake it 2 minutes less…or even one minute. malaking diperensiya na yun. huwag niyong lamunin ng mainit pa kasi tunaw pa ang queso at maglalasalng hilaw. let it cool a bit. pero ako WALA akong pakialam que maglasa siyang panis, para sa akin da best ang hinayupak na ensaimada na straight out of the oven). at higit sa lahta, bago po kayo lumamon ay magdasal kayo ng isang hail mary dahil tataba kayo ng sobra…. I love it when marc used the word hinayupak—don’t know exactly what it means but it sounds so funny and so brusco!!! Thanks for sharing this heirloom of a recipe. Will try it someday! MM sa totoo lang ang PANGIT ng pagkain dito….mahal pa.
marc, malamig pa. Are you there for just a year? Uuwi ng pasko? Buy good kippers at Harrods food hall, microwave, eat with eyes closed together with vinegar and rice… parang tinapa! Maraming, maraming SALAMat, MARC sa HINAYUPAK na pagsasalaysay ng iyong gintong recccipe ng iyong lola!!!!!!! !MWAHAHAHAhaha….hahahaha……I think IKAW ang kailangan magdasal ng ISANG HAIL MARY at MARAMI KAMING SASAKIT ANG TIYAN from laughing tooo much today!!!!!!!! I think Lee is dethroned!!! A soon-to-be Oxford alumnus who can make ensaymada, has a great sense of humor, and is not swapang…… Marc, single ka pa ba? Christina Foss, me too, I remember La Pacita ensaimada! Sometime in the 90s, I lived in San Juan several houses behind La Pacita/La Perla biscuits and could smell the baking from my window. Warm memories. Hay naku Marc, naluluha ako sa katatawa reading you. Salamat ha, what a nice way to end my day! And in these days when so many cooks guard their recipes, your generosity is so refreshing. eh kung sarili kong kapatid at mga pinsan, they’d rather buy eh. really time-consuming. sobra. single na single pa pa ako. balak ka ata mag-heswita may problema lang ako sa vow of poverty….ano ako ULUL??? make sure you use instant yeast kasi kung ordinary yeast ang gagamitin niyo, babangon kayo ng alas cinco ng umaga para mag-umpisa at mabe-bake kayo ng alas once ng gabi sa kakahintay mag-rise. sabi daw ng kasama ng lola ko mas masarap daw kung ginagawa LAHAT by hand instead of mixer. kaya nung natuto ako when i was all but 10 years old, ako naman isa’t kalahating tanga, sumunod. eh ba naman ginawa kong de mano lahat ng procedure??? hoy MM di po ako nagpupuntang harrods kung wala ang aking travel time na nanay dahil masyadong mahal. pinapabulok ko nalang ang smoked salmon tapos ini-imagine kong tinapa…. taksyapo mung marc digsu na ku mebulunan keng tula kareng comments mu! everytime i go home for a vacation i never miss buying the best ensaymada. tsokalateng batirul and ensaymada…yum!yum! mumuli kami next month and in our itinerary includes trip to abe’s farm for a whole day stay there to relax and for massage, and hopefully, they have great food as well. your ensaymada sounds so goooood. nokarin ku makapag-order kareng ensaymada yu? OMG, can’t stop laughing, Mr. Medina, you should be a stand up comedian. Please hold a one man show called Ensaimada. Part two naman can be how to make tinapa in the UK. Hey, anyone interested in an Ensaymada pigging out here in Vancouver? I am volunteering Onie’s kitchen!!! We will do or rather bake using Marc’s, Sister’s and yours truly…recipes…I will scale it down to a manageable quantity and on hands demo with TRICKS OF THE TRADE!!!!?? ?…My taste testers are ALL GAINING WEIGHT!!! If I do this on my own, as Marc would say…”ano, ako lang ba ang tataba?” We might as well…lahat tayo magsitabaan!!! Sayang, Marisse! Sana you were here!…Anyway, Onie, are you up for it? I will bring my equipment and different size moulds (para hindi magkulang depending on how many bisita you will have! )…My fee? Pakakainin ninyo ako mg Binagoongan! Kasi my hubby imposed a martial law at home on cooking Bagoong!!! hahaha!! i just surfaced from TV and kitchen–this is so funny…ok, bettyq! will do. i think i’ll just end up buying..this is quite intimidating!!! Marc…or Estella…pardon my ignorance but is hinayupak a Kapampangan word? no, bettyq, i don’t think that hinayupak is a kapampangan word. estella, ing ensaimada mi atin ya king salcedo market every saturday. munta ka karen maranun kasi masyadong mapagal mig-bake more than 2 dozens a day. megisan ya very early. for those who go to the salcedo market, i also recommend the ensaimadas of des rodriguez torres. she has a stall called “pampangan,” which sells kapampangan homecooked food of the rodriguez clan. ganda ng kapampangan ko no? halo-halong tagalog at ingles. also, if you plan to freeze the dough the night before, i’m afraid that wouldn’t apply for my recipe. i don’t know why. i tried it by freezing the dough BEFORE the last rising. it didn’t work because by the time the dough thawed, patay na yung yeast. it wouldn’t rise anymore. i think because the dough is just too heavy. if you guys mnage to modify the recipe so that it can freeze, do let me know. Manong Marc…pasensiya na kasi baka ako murahin mula ulo hanggang paa kung gagamitin ko dito iyong hinayupak though i don’t mean to offend anyone!!!! If you were to freeze the dough, here is what I would suggest, Marc…We used to do this in one of the hotels I used to work at before it was named Sutton Place…the final shaping like coiling it…arrange it on single layer on an idustrial baking sheet lined with parchment paper…then put it in FREEZER. When frozen, that’s when you pack them in pastic bags tightly sealed!…Now, night before , take them out and arrnge them in your moulds. Let it thaw out in the cooler. Then …we put it in a proofer…remember, yeast is a living organism. It will WAKE UP when you subject it to certain conditions….like putting the shaped or coiled ensaymada in a proofer! Before you say, ano ba yang proofer na pinagsasabi ko?….aparador na meron mainit na tubig sa loob! Before I forget, HUWAG NINYONG KAKALIMUTAN na takluban ng pastic wrap and ensaymada tray so it wouldn’t dry out in the cooler. Do you know how to simulate a proofer at home without wrecking your aparador? salamat, marc. sige munta kami pen king salcedo market para saling ensaymada yu. ali ke balu itang address na ning salcedo market uling manibat kami pa king clark. e bali i can find that out. nanu la kaya oras mag-open karin? aside from ensaymada, i am also craving for burong asan. malambat na kung ali mamangan kanita. i hope that puwede kung makasali kanita king rodriguez stall. that’s the name of that thing everyone was telling me about! proofer! that’s the best way daw to make ensaimada in cold dry places! also, if you want to make buro you can’t make it there kasi masyadong dry yung weather UNLESS you have a proofer. the fermentation kasi of buro requires humidity. thanks for the tip. i just froze it and didn’t wrap in a plastic bag and of course no proofer. kaya ayan, patay. so how do you simulate na hindi mangangamoy panis na medyas ang aking aparador? and yes, the rodriguez stall called “pamangan” pala has buro and balo-balo. every town in pampanga has their own version of bulok at namumulok ni isda at hipon. the san fernando is version of everybody’s cafe is ok.
i suggest you go to the salcedo community market early. it opens at 7am up to 2pm lang on saturdays. its at the jaime velasquez park on leviste and otrdesillas streets, salcedo village makati. you can’t miss it. hinyupak na traffic. bwisit. Hahahahaha!!! No wonder I felt like opening my computer at 5 in the am. Marc,you’re crazy…talagang ___yupak!! Thanks for your detailed description of your ensaimada. Now I’m more challenged to to do that ensaimada. Binata ka pa!!! !And cook so well.Thanks for being unselfish about your recipe.Kudos!! Thanks Ecc for the Saveur link. I slept so late going thru all the wonderful recipes and I picked up a pecan pie recipe I’ve been dying to try cuz my hubby loves pecan pie. bettyq,will email you. If I only read your email I would have done that last night. I envy the experience you got while working at those restos and hotels. Inggit. Ms. DhayL…really sayang! But let me know if you happen to visit Vancouver! Manong Marc…back to you! Do you mean to tell me that you only sell 2 dozens of enasymadas? I am not Kapampaangan but I cannot help but try to understand what you are telling Estella! For those who would rather buy your ensaymada at Salcedo, you could do this…I was just kidding about your aparador! If my baking instructor saw my comments, ilalagpak ako!!! Anyway, I don’t know how much volume you intend to do. If you are looking at something like 8 dozens or more (kasi naman napakalaki ng ensaymada mo!! !,,,,kasing lapad ng mukha ko yata!!!!!!!!) try this…if you want to invest in a baking rack…I think it can hold about 10 to 12 industrial baking sheets. You don’t need to put the rack inside a metal”aparador with built in heating system for steam. Leave the bottom rack empty and place a 1 burner stove on there with a pot of boiling water. Once it is boiling, turn the heat offf but leave the pot in there. Now, take a plastic cover like the one you cover a greenhouse and fit it snugly all around the rack OR You can buy one that zips up on one side ready made. Now, if you only need to do say 2 dozens and don’t want to use this baking rack thingy, use your oven…NO HEAT! DO NOT TOUCH THAT THERMOSTAT no matter how tempted you are!!! Put your ensaymadas in it and put a pot of boiling water on the bottom of your oven.That should do it and your medyas will not smell PANIS!!!! Another trick or option…if you can get an old fridge from someone who will throw their old fridge…get it!!! But be sure it has the racks in it. Take out the compressor or whatever electronic gizmos are in there. Put a 1 burner stove in there if you like or You can put a BIG CALDERO IN IT WITH JUST HOT BOILING WATER on the botttom. Check your ensaymadas after 1 hour or so . You might need to replenish the hot water! Marc, we miss you and your torn-jeans-with-boxers-peeking-out at the market. Since you left, too many “meetings”! Ano ba. Buti ka pa, you were a one-man, instant justice system, mwehehe. yan lang po ang nilang pwedeng pagpilian…. marc, makatula ka talaga! your sense of humor is so refreshing. baka ali ya mu acacia tree ing tumubo pota atin mu ring indian mango tree…ha!ha!ha! i am so glad that the rodriguez stall is also selling the burong asan. siguradong mag-dinner kami king everybody’s. ita ing hang out mi aniang high school uling kaklase ke itang mikibandi king st. scho. hundred years ago. i can almost taste it now… balobalo and mustasa! Mwahaha! I don’t know you Marc Medina (aside from the mentions in this blog) but you are hilarious. And I make great bulok na isda at kanin, a.k.a. buro although I am not kapampangan. My mother is from bulacan and I grew up eating it, now making it. And sharing recipes doesn’t mean losing customers. I would still rather buy this than make it, hehe. 22 egg yolks and doing everything by hand! Applause, applause! I am a baker but not a bread baker. Will pick up some ensaimada when I pick up my ornaments. Betty q., if your hubby outlawed bagoong, he will issue a permanent restraining order for anyone living within a 100 meter radius from making buro! It smells to high heaven when you saute it but that’s what it makes it soo good. The smellier, the better fermented and yummier! I can’t for the life of me, entice my friends to try it because they say it looks like (hinayupak na) upchucked stomach contents. love the exchange here!. Marc, kassama ang Salcedo Market sa itinerary ko when I go home in December. Hope to meet you! Ok, Marc…sa oven mo na lang ilagay ang ensaimada mo. Pero sa LAKI ba naman ng ensaimada mo, 6 lang ang magkakasya. Ikaw rin! Do not put the ensaimada frozen . if you do that, the top will be really super duper sticky before it has a chance to fully rise up to the top. And, no….walang tutubo na punong acacia!. If it did, marami na akong seedlings na puede ipamigay!!! And no, Ragamuffin…I have my lap top anywhere with me around the house . If I am downstairs, it goes with me! And yes, I am a CRAZY FOODIE TOO! Marc…sige na subukin mo ito ….Who knows, baka marami kang mataob na ensaimada vendors diyan! I am SURE YOU ALREADY HAVE!!!!!!!!! !Hey, pag uwi ko diyan…bibisitahin kita sa Salcedo!!!! Marc, I love you! You had me laughing out loud very early in the morning. Thanks for not being swapang! You will be blessed all the more for your generosity. This is why I love this site – It makes me laugh, it makes me cry, i learn new things and most of all because MM and family and all the commenters share generously! Marc: Ngek! I’ll order from you na lang! Haayy.. salamat. Michelle h is the last entry. I can now go back to work. hahaha to diday..my sentiments exactly!! This post was really hilarious. BTW, to m’bettyq. regarding your ma chang recipe—well i think i’ll go with michelle h’s 3rd reaction :” Ngek, i’ll order from you na lang!” it was that daunting! many thanks for the recipe, though. bwahaahaa! Yes, can you imagine too, I read all comments. I can get fired doing this. I’ll fire myself. Anyhoo, the recipe looks intimidating especially step no.6. that I’d rather buy. I haven’t found the ensaymada I like. Hope to try the Medina’s ensaymada soon. Hahaha! Why do I feel that there will be a bunch of MM readers at the Salcedo Market tomorrow clumping around the Medina ensaimada? I am so tempted to be one of them if I didn’t have a meeting! Thank you for the heads-up on the Saveur article, Marketman! I will make sure to get a copy tomorrow…or maybe on Saturday. I want to avoid the Black Friday maddening crowd. Mr. Medina, salamat at napaka-generous mo naman in sharing your heirloom ensaimada recipe, kumpleto with side comments pa, LOL. Pero, as much as I love baking eh for some reason takot ako to work with yeast. Ergo, I have never baked bread. Just like most people, bibilhin ko nalang yung ensaimada. Endless visits to Marketmanila website is ground for instant dismissal. We can all go home and work for MM and there’s more….if you show a printout of your name on the comments area is a warranty to a 50% discount of any goods from Salcedo Market. Ehemmmmm…. hi m’ bettyq..i think from what MM wrote above, Marc is at Oxford! yung ma chang recipe nyo, parang napakahirap. i swoon when i read your steps in making the balot. parang hindi ako marunong umintindi ng instructions. that’s why i figured, i’d buy na lang! but really good ma chang are very hard to come by. hay naku! hahahah!!! nung nabasa ko yung travel time na nanay, bigla akong nahulog sa upuan ko! you mean, si miss susan calo-medina ang nanay mo? sobrang premyadong figure yung nanay mo, tapos nakakatuwang mabasang ganon mo siya i describe. sobrang napaha humble mo sigurong tao! salamat for the recipe . my God it`s 3 a.m.at kararating lang namin from a thanksgiving party and here i am naka tutok sa computer reading market manila and all the comments.instead of going to sleep so ican go shopping on black friday ,nasa harapan ako ng comp.i had a good laugh with marc`s comments.thank you very much,marc for the recipe.bettyq i`ll try to make the ensaimada one of these days. sa mga taong madla na wala nang ibang ginawa kundi mag comment sa blog na ito…ako po’y lubos na nagpapasalamat sa inyong mga puri…di po ako humble…baliw lang… o kaya nababaliw na ako dito sa oxford university dahil sa totoo lang sukang-suka na ako sa pagkain dito. bilang ganti sa inyong puri, ilalagay ko po dito ang isa pang recipe ng akong kapampangang lola na matagal na pong patay (old age ha, hindi sa kolesterol!). ang nagturo po sa akin ng adobong ito ay ang kapampangan kong ninang na matagal na ring patay. ito po ay specialty ng taga-luto ng pamilya ng tatay ko na patay din. kung na-notice niyo, yung pong mga nagturo sa aking magluto lahat patay. ang lola ko, patay; ang tita ko, patay; ang tagaluto ng tatay ko, patay din. lahat patay. pero marami pa pong magaling magluto sa arayat na buhay. kahit mukhha silang patay o masarap patayin, buhay na buhay po sila. ito pong recipe ay galing sa ginintuang december issue ng saveur magazine (di ko rin ma-pronounce yan inday). Chicken Adobo (dapat po chicken pork adobo, dahil ang pork po ang siyang nagbibigay ng lasa sa adobong ito, at siyang nakakataas ng kolesterol). Be the first to rate this recipe (ay naku inday, subukan niyong mag-criticize ng reciping ito kundi kayo bisitahin ng ninang ko…patay na po siya). Adobo is often called the national dish of the Philippines. The preparation is endlessly adaptable, and nearly every Philippine cook prepares adobo in a slightly different way. Though some add soy sauce to deepen the color of the dish, we followed Lucia Mallari’s method, which omits that ingredient. Philippine cooks favor mild-tasting vinegars made from coconut or palm sugar; we found that white wine vinegar makes a fine substitute. 10 bay leaves (dahon ng laurel. di po kailangang galing sa manila bay). 1. Place chicken thighs and legs on a cutting board and, using a heavy cleaver, cut each piece in half crosswise, through the bone. (Alternatively, leave the chicken pieces whole.) Sprinkle chicken pieces generously with salt and place in a 14″ nonstick skillet. Add garlic to skillet along with vinegar, peppercorns, and bay leaves. Bring to a boil over high heat; stir briefly, then lower heat and simmer, basting chicken occasionally with liquid, until meat is cooked through and most of the liquid has evaporated, about 40 minutes. (sa madaling salita: ipakulo ang manok sa suka na may paminta, bawang at laurel, tapos. ang tawag dito sa kapampangan at “SINGKOTCHA.” as in “isisingkotcha ko na ang manok at baboy.” kung gusto niyo mag hinayupak na fried chicken na sobrang sarap, i-singkotcha niyo muna tapos ipatuyo bago i-prito sa lumulutang na taba ng baboy. walang sinabi ang kolesterol ng kentucky fried chicken…isang lang pong paalala: bag nagpapakulo kayo sa suka HUWAG NA HUWAG niyong galawin o ihalo hangga’t di pa kumukulo ng husto ang manok at baboy or else di maluluto ang suka at maglalasang hila. also, HUWAG NA HUWAG niyong takpan ang kaldero pag nagpapakulo kayo sa suka. 2. Increase heat to medium-high. Continue to cook chicken, turning it frequently, until crisp and lightly browned all over, 6â€“8 minutes. Transfer chicken to a platter and serve with steamed white rice, if you like. I will be in Manila next week, wednesday and Thursday. Are there any other outlets for this famously intriguing ensaimada? Would very very much like to bring some back to Cebu. marc, lalo ku tuloy me homesick keng recipe mung ini. i can’t wait for next month potang muli kupinas kaya ilutu ke ining recipe mu today. i already have the baguk and kamatis… you’re so nice to share this recipe. Teka, on a serious note, thank u, thank u for posting the adobo recipe, kc aaminin ko, nd ko talaga makuha-kuha ang lasa ng adobo, ewan ko kung bakit, ayaw sakin talaga. So hopefully success sya once I try your recipe, at kung nd eh naku, I guess malolokah na ako and too bad kc never ng makakatikim ng adobo ang pamilya ko, or it could be worst baka dalawin ako ng mga taong nagturo sau ng adobo dahil ka-simple-simple nd ko makuha! buahahaha. thank you for your adobo recipe, Marc. I have never tried making adobo this way, parating may toyo (obviously, hindi kami Kapampangan). Masubukan nga ito and I’ll see if the asawang kano prefers this version. This isn’t about food but I am enjoying the Kapampanglish even if I don’t inderstand. It sounds like Frenchified Pilipino. No insult to the Francophile or the French speaker. I wondered though how the Kapampangan language ( I think it is a language vs. just a dialect) evolved and how it originated being sandwiched between the greater Tagalog region and Pangasinan. naku connie huwag mo nang sabihin sa mga kapampangan na parang french ang salita nila dahil lalong lalaki ang mga ulo ng mga hinayupak na yon. na-sandwich po ang pampanga sa kalagitnaan ng mga panggalatok at mga tagalog dahil nung unang panahon na mas nauna pa sa kapampangan kong lola na matagal ng patay (kilala niyo na po siya)…ay may bumiyaheng datu na galing borneo na ang pangalan ay datu sumakwel…o datu humabon…o datu puti, datu patis, datu ketchup…ewan basta datu siya at di siya alipin. take note siya’y sumakay ng barko na walang makina sa likod at nag-landing ba naman ang mokong sa bukang-bibig ng pampanga river? eh di may i settle down ang hinayupak na yun….at naging kingdom of pampanga mula hundred islands hanggang tondo. ito po’y nangyari sa panahon ng madjapahit sa indonesia. promise. di po ako nagsisinungaling. kasalanan daw yun sabi po ng aking lolang matagal nang patay. Ragamuffin girl…I was wondering too if everyone was just reading and doing nothing but stay on MM’s blog. Hahahaha..I work but I open and close my day by reading MM’s posts. (Of course,thanking the Lord muna). This Savuer entry has really attracted so many comments and really is sooooo funny. Feel I belong to a crazy family. Am on my way to marketto do my marketing and to buy some chicken. Will try that kapampangan adobo (no vinegar). Looks easy.Thanks Marc. Opposite of chinese adobo (am I correct? ) They dont put vinegar. hi everyone! funny talaga si marc! super aliw ako sa kanya! i agree with you, ms. marissewalang kaparis —- thank you MM for our wonderful, funny, foodie family! Thanks for the little bit of history. Pero talaga, hindi ba nakakalasing yong 10 bay leaves in your adobo? I only use one and I taste it already. But I trust you enough I will try your recipe. You are not in Oxford for nothing. Bay Leaves…laurel nobilis or California bay or Indian bay at saka isa pa na nakalimutan ko na…The strongest in flavour is that belonging to the California Bay family…I think the one back home is the one belonging to the Laurel nobilis family….most commonly used in soups and stews…not as pungent…according to Mr. Wiki!….and Connie C…maybe hindi kasing lapad ng mukha ko ang mga dahon!!! I agree Connie C that it is up to us to hand down thse traditions, recipes close to our hearts…that is why I urge you , my little brother and my big Ate (I know you guys are lurkers!) to get your hands dirty and learn how to make these things that you gobble up since I am not going to be around forever! Yan din ang sabi ng lola ko.. pero buhay pa sya =)), it’s true lasang hilaw or sariwa ung suka pag tinakpan, gaya din ng lutung paksiw.. ken kapampangan ;) paksing bangus or tilapia…..
I’d like to thank Marc for posting the recipe – and chime in and say that I prefer the chicken AND pork version we had last Christmas. The fatty pork below adds a certain (artery-hardening) something that the chicken-only version lacks, and when I tested it at home for friends there was nothing but ‘mmmmms’ all around the table. I say moderation in everything – and pork in every adobo! Hi Marc!! I did the chicken adobo for lunch and it was really good! I placed in the 10 bay leaves and I guess that is what makes the flavor outstanding–with the vinegar really good. Mine came out a bit pale. My husband tried it and said it was really tasty and it smells so good. My son came out of the bedroom and looked into the boiling pot…looked and felt hungry….Now I know how to make kapampangan adobo.I made one kilo and it was gone in a whiz. I will do it again and do a few tweaks to make sure it has a better color. But for taste–it was great!! !Thanks Marc! Thanks MM! bettyq, any suggestions what to do with leftover roast turkey? i’ve got leftovers from the thanksgiving dinner. i’ve made open sandwiches and turkey rice soup. any other yummy suggestions? marissewalangkaparis (wow, what a long name! ), i myself like color with my dishes. whenever i cook adobo, i fry separately the whole little sweet peppers and then mix them with my cooked adobo. the sweet peppers come in radiant colors of red, yellow and orange and are not so spicy at all. they’re also good to eat with the chicken adobo. Use turkey as filling for fajitas or enchiladas! also make curry sauce and add cubed turkey …use that as a filling for vol-au-vent…if you don’t want to make that from scratch, use sliced buttered bread and fit them into muffin tins and bake till nicely browned (PATTY SHELLS!) or instead of patty shells, make profiteroles and cut it in half and fill it with curried turkey!…makes yummy appys if you like curry!…another appy would be use it as a filling for phyllo pastry and wrap it like spanakopitas. another yummy use for it would be to make it into something like a crab souffle….using shredded turkey instead…line bottom of pyrex dish with slice white bread about 4 or 5 whole ones.Then cube another 4 or 5 slices white bread..mix turkey in with a bit of mayo say 1/3 to 1/2 cup, some celery, chopped and some choppedgreen pepper and bit of chopped onion. Spread over the bread. Then amke a custard…3or 4 large eggs and 2 cups milk and 1 cup whipping cream. Pour it over the turkey mixture. Cover and put in cooler overnight. Next day. bake it …uncovered at 325 degrees for about 20 mi nutes. Take it out and top it 1 can cream of mushroom soup or cream of chicken soup. Top with grated cheese and paprika and bake again for 1 hour. REMEMBER>>>>>THIS IS LIKE A SOUFFLE! IT WILL PUFF UP so do not fill the pyrex dish more than half full! Marc, grabe, your tagalog sprained by brain. Ano, ba! maawa ka sa Ilongo brain ko!!! Thanks for sharing your ensaimada and adobo recipes. I remember you were going to give me the ensaimada recipes because none of your relatives and in-laws wanted to do it. I had to get a copy via Saveur and Marketman. Sus!!! Anyway, will keep in touch. bettyq and estella,will take your advise re how to improve the color of the kapampangan adobo. But it really tasted so good–to the bones–full of flavor–and the adobo aroma was really wonderful.My family is visual and I really will improve the color.Thanks again Marc!! Mm–will wait for your ensaimada –am excited as am takot to try it out pa. Still am doing my holiday menu “review”. Estella,suggestion for turkey–fast and easy. Chop them up. Serve in halves of soft pita–with inside garnish of spring onion and a one inch julienne of cucumber. Have a choice of sauce to place into it(use one at a time ha? )—I have Hoisin and Honey mustard and Garlic cheese. Try it. Teens and kids love it. It’s a bastardized version of Peking Duck. You can do that too with leftover lechon meat or leftover roasted chicken. Just have as one of the sauce choices–lechon sauce.Good….and so simple and easy. I have been to every magazine stand/bookstore in Trinoma AND Gateway and I have NOT found Saveur. Ayayay. What I found was Food mag featuring Kapampannag dishes and Appetite mag (i think) featuring dishes from Cagayan de Oro and Camiguin. FYI, what we Pinoys commonly refer to as dialects are actually languages. Very distinct forms of verbal communication. Dialects are variations of a single language such that it is still recognizable or understandable (somewhat). So Visayan, Ilonggo, Kapampamangan, etc. are all languages. Dialects would be the different ways English is used: British Eng., American Eng., Australian, Philippine, Singaporean (Singlish)… You get the picture. For adobo, my Batanguena friend adds luyang dilaw (turmeric?/yellow ginger?) to the blond adobo and it imparts a nice subtle flavor and also colors the dish a more appetizing yellow. Better than atsuete, I would think. Hey Lex, are you DADD-F’s hubby? Your Ilonggo brain gave it away!!! Betty q., I don’t think I am that Ilonggo. I don’t know who DADD-F is, sorry. Must be someone else……though my hubby is partly Kapampangan too. My lola adds achuete to our adobo for color and flavor too. Our adobo is not toyo laden either. Marcos, I think you should start your own blog on your spare time. You will definitely have a large following. Just saw Saveur and it does not do justice to Filipino Christmas fare. Marc, I tasted your ensaimada at Salcedo market when I visited with Marketman. I just sent Marketman a 25 lb.sack of bread flour so he can practice his ensaimada, the recipe he published requires fine tuning with practice. As for yours, it is respectable, but do you really need 3 tbsp. of yeast for 7 c. of flour? I thought that was a typo. Congratulations and best wishes for the holidays. yes 3 level tbsp or 2 heaping tbsp. the yeast-y taste is what gives this ensaimada some character. yung mga iba binabawasan yung yeast para di masyadong matapang. hindi aalsa kasi yan kung kulang ang yeast. remember unlike other ensaimadas yung queso mo nas LOOB hindi sa ibabaw ng ensaimada. so don’t expect that melt in your mouth ensaimada which to me is not ensaimada. ang ensaimada kasi ng kapampangan it’s a meal in itself, hindi yung gaya ng ensaimadang tagalog. it’s actually closer to the torta of cebu and bohol than the ensaimadas of manila. 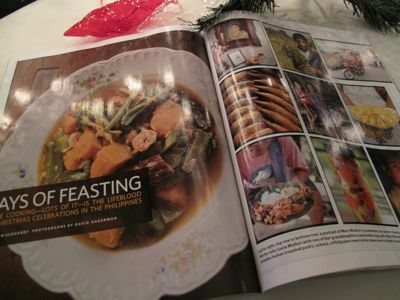 Sister, the only thing that would do justice to Philippine Christmas fare is an entire book of essays, photos, and recipes. But we’re talking about a magazine here. Unfortunately, magazine editors are bound by the dictates of their audience (which determines advertising dollars) the majority of which, in the US unfortunately, know little to nothing about PHI cuisine, and care even less. 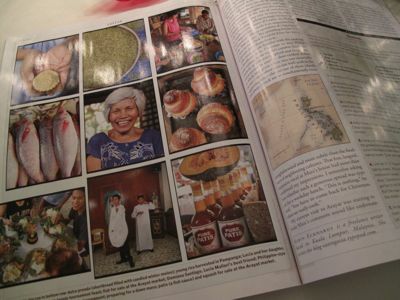 Saveur is, I believe, the first major American food publication to include a feature on Filipino cuisine. That’s a pretty big deal. That the article and its description of PHI Xmas fare did not live up to your expectations is unfortunate. But I think you need to attune yourself to the realities of the American publishing industry. Give Saveur some credit for taking the risk (yes, it *is* a risk to devote a number of pages in an issue as important as December’s to a little-known and even less-understood cuisine) and at least wee bit of credit to a writer (yes that’s me) and a photographer who put their hearts into the article. It may not be what you wish it to be, it may not be YOUR idea of what a Philippine Christmas is, but you know, not every Filipino sits down on Christmas Eve to a groaning board. For me what Christmas is in the Philippines transcends how many, and which, dishes are on the table. Filipinos are by nature incredibly warm and generous, and I’ve rarely felt the Christmas spirit as much as I did last December in Arayat. THAT’s what the article is about. Apparently that went over your head. right on, robyn! i really think that you did a good job on the article as well as the pictures that went along with it. i’ve never felt the christmas spirit here in united states just like i did when i was growing up in pampanga. christmas is not all about presents and sumptuous food. it’s about gathering of friends and families and the excitement on children’s faces. this is the reason why i can’t wait for next month to celebrate christmas with family and friends! and, robyn, i hope that you’ll be in san fernando on dec. 2oth evening for the huge lantern parade and contest. the last time i was there for that occasion was about thirty years ago and i am so looking forward to that. She got it exactly right. And, if I may add… “Proper” English spoken in the Philippines is yet another dialect (of English), while Taglish is another animal altogether: it is a creole language. Anyway… this whole comment thread is highly entertaining and informative. I’m gonna have to try to find that Saveur issue. As for Christmas in the Philippines vs Christmas abroad, I’m gonna have to be the contrarian here and say I prefer Christmas here in the US. I think it’s because what we have here now is what we had back in Manila: a small-ish extended family. Each nuclear family has its own little Christmas Eve get-together with fabulous food, opening presents at the stroke of midnight. The, on Christmas Day, the entire small-ish extended family gathers at one of the houses for yet more eating and to distribute the presents to one another’s kids. Exactly like in Manila. I thought bec. Marc was in Oxford wala nang ensaimada sa Salcedo, it’s there pa din pala after reading all the comments. Yahoo! Will get loads this Christmas! laila, sige sabian me ing email mu kanaku at para sabian ku keka nung kapilan kami atyu pilipinas. tuknang kami most of the time king mimosa. i’d love to meet you and it would be fun to go to salcedo market with you. ali ku pa minta karin. mumuli kang weekend king angeles o maratun na ka manila? sali katang dakal ensaymada ketang stall da di marc, okay? see you soon! i can see why mm and marc are best buddies. both witty and smart :) I can just imagine the exchanges of these two over dinner. for the record: si marketman ang unang-unang nag publicize ng hinayupak na salcedo market na dating napaka-charming at ngayo’y malaking sakit ng ulo. pero enjoy pa rin mag-shopping dun kasi maramaing sosyal at nagkukunwaring sosyal. at pag-umuulan, nagsisilabasan ng payong na may malaking tatak na “GUCCI”…laban ka? payong lang yun ha! malaking malaking tulong ang naibigay niya sa mga nagtitinda sa salcedo market. kaya malaki ang utang na loob namin kay marketman. kahit umuulan at walang sun na bumibili sa iyong stall???? kamag-anak ni facifica falayfay na naka gucci o fendi sunglasses kahit madilim ang panahon na bumibili sa iyong stall? fendi o gucci sunglasses! deal or no deal???? ala na ku king market! ati ku queni king oxford, mag-master’s ku king development studies. aduwang banua ku keni (pota mag doctorate pa ku). nung munta kang salcedo market, panintuan me i des rodriguez torres. manyaman ing ensaimada ampong tocino del cielo. aba, samasan mung magaral para potang mayari kang mag-doctorate, baka ma-assign kang maging phil. ambassador to the united nations. by that time a palitan mu ne y ban ki-moon as u.n. secretary general! potang atyu na ka king u.n. office in new york karin tamu magtindang ensaimada uling dacal a magobrang pinoy karin. aku mu rin megobra kung a few years king undp manila kanita. mag-apply kung un volunteer keng third world country pero ali ku man mekalako uling me assign ku king office mag provide psychological tests karing pinoy volunteer applicants. okay na murin uling i met a lot of volunteers coming from other countries at deng reports da padala mi la king king u.n. geneva. anyway, pakikumusta mu na ku kang prince william, okay! in two weeks atyu na ku pinas at munta ku pa mu rin king salcedo market king stall yu. ninung balu mung magtindang manyaman detang candy made of carabao milk. akalingwan ke ing lagyu na. good luck on your studies!!! ay sayang. ing magtindang pastillas ing sacristan ibat arayat. megtinda ya kanita a few years ago. pero ngeni ala na. ala nang manyaman karen. ing magtinda karen, or anywhere else in pampanga, they add extenders to their pastillas. they add egg yolks to the carabao’s milk para merakal. you’ll know if it’s pure if it’s naglalangis and very white. marc, uwa pala pastillas ing lagyu da. i miss those so much also kaya sali ku kareta potang muli ku. bisa ku mu naman mangan mapaling nasi with gatas damulag, ditak asin ampong saging…yum! how about pindang damulag? ali ku pa tikman ita for many, many years! can you send me an email of the dishes you want to have during your visit to pampanga? i can refer you to many places. like the gatas damulag and rice (i eat that with tuyo and/or bagoong). devonshire pudding for christmas…hahaha!! !maligayang pasko and all the best for the coming year!!! hi Estella, sige buri da ka pin ameet! meexcite naku man karing sinabing mung buri mung kanan…:) anyang anak kupa mamangan ku ketang gatas damulag and pindang! winner!! !hahaha ayni pala email add ko, laila4_8@yahoo.com. mumuli ku every other weekend king angeles, panikwanan dakang imeet karin neh? kapilan ka pala datang kening pinas? laila, i’ll send you an email before i go. excited na ku murin ameet da ka…. to mm and family…a blessed and merry christmas and a wonderful new year!! more than a year since the last entry, but unfortunately I have just read this and enjoyed each and every entry – laughed till tears came to my eyes :-) Still my favorite pinoy blog. Marc is hilarious. thanks to betty q. for her input on the proofer – have been frustrated with my ensaymadas not rising enough in this climate. Robyn, would you know if there have been/are any other articles written on Filipino cuisine in the French version of Saveur? Unfortunately it is not that easy to find the American version in French-speaking Switzerland, and I missed the article everyone’s raving about. And do you know of any good pinoy restos in this part of Europe? There have been 1-2 good ones, but they don’t stay open for long. Presentation could be a reason – folks here are used to Thai and Japanese artfully prepared platters. Another reason – ignorance of our wonderfully varied cuisine. We desperately need more articles from you and your peers. Thanks!